That’s the grim outlook from board members of The Bulletin of the Atomic Scientists. 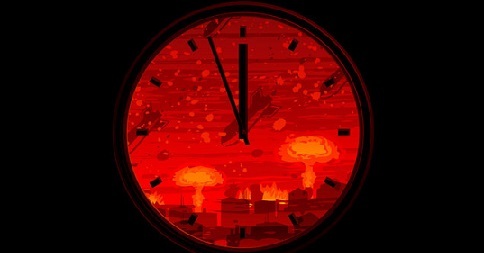 Frustrated with a lack of international action to address climate change and shrinking nuclear arsenals, they decided today (January 22, 2015) to push the minute hand of their iconic “Doomsday Clock” to 11:57 p.m.
It’s the first time the clock hands have moved in three years; since 2012, the clock had been fixed at 5 minutes to symbolic doom, midnight. So why did the Bulletin of Atomic Scientists move their iconic Doomsday Clock 2 minutes closer to midnight and cite global warming as a major reason? The proliferation and modernization of nukes I can understand. Human civilization can be destroyed in half an hour if there was a large scale nuclear exchange. But by the time the terrible effects of global warming are supposedly to be felt to the fullest, you and I and all the scientists caught up in this issue will be dead. Why not cite death by a gamma ray burst or a comet striking the earth? Those events are just as likely to occur over the next 100 years as catastrophic global warming. In 1984, the last time the Clock was moved to 3 minutes to midnight, liberals made a huge deal about it because, well, Reagan and his anti-communism that most liberals predicted would blow up the world. Instead, communism blew up – much to the chagrin and sorrow of liberals. Today, the movement of the Doomsday Clock under a Democratic president is ignored because, well, Obama. The scientists wouldn’t have dared mention it, but one of the reasons we’re closer to the end of the world today is we have a putz for a president who combines incompetence with naiveté – an extraordinarily dangerous combination. These next two years are going to be the most dangerous period since the 1950’s as Putin tries to distract the Russian people from the ongoing economic meltdown. The chances for confrontation over Ukraine, or some other former Soviet satellite make the near future a roll of the dice and no one with half a brain feels confident that Obama can manage a crisis like that. Which is more disturbing: Obama’s speech at the prayer breakfast or the audience response?